Have you seen calzones being made at Italian restaurants? The whole process is so mesmerizing, isn’t it? Years ago, when I worked at an Italian restaurant, my favorite thing was to watch the pizza chef make calzones. He was so talented and his fingers would just fly when he was making them. Every shift, I would wait for customers to order them. Then, I would watch him effortlessly make those delicious calzones and place them in the brick oven. 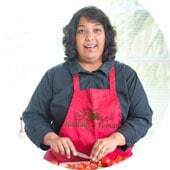 If a kid was crying, the chef would ask them to come sit across him while he made them. He gave them a small dough and asked them to follow along. They would squeal with delight when the chef pulled out their calzones from the brick oven. Those kids absolutely loved being a part of the meal making process. When he removed them from the oven, they would be piping hot with tomato sauce and cheese oozing out of them. It was a totally drool-worthy site! No one could resist biting into them. I don’t know why it has taken me this long to make calzones (AKA folded pizza) for the blog! I don’t have his talent, but, I still love eating and making them. P/S: Have you tried my paneer pizza or my potato pizza? Why is it called a calzone? 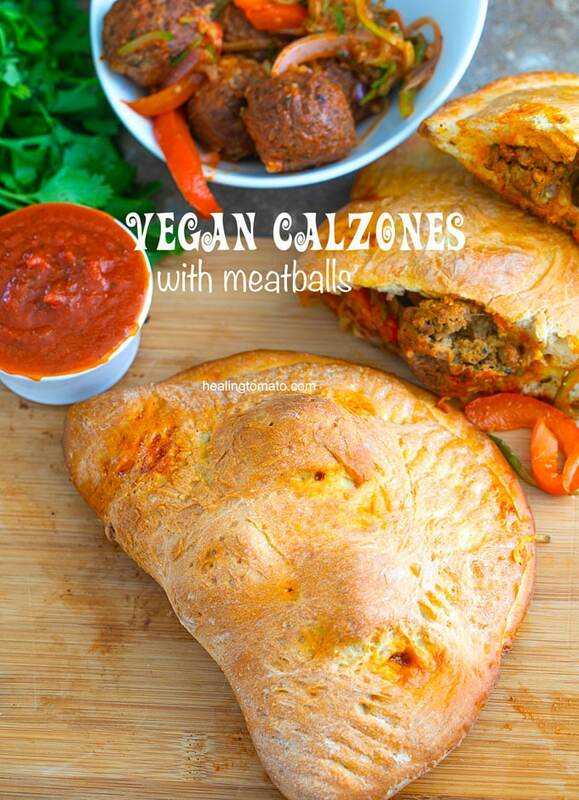 How to make vegan calzones stuffed with meatballs? I have been reading on the history of calzones and htere are so many theories out there. The most common explanation I have heard is that Calzone translates to “stockings” or “pant legs”. I take it to mean that it pizza that you can eat while on the go or even put it in your handbag to take to work. Ok, maybe not the second one. But, the idea behind it is that its folded over pizza so that it can be mobile. I have tried freezing calzones before and learned a few tips and tricks. I often wondered why there wasn’t a lighting bolt striking when people asked that question, lol. The two are so different in look and taste that no one could think of them as similar in any way. The calzone is a half-moon shaped and stromboli are long, log shaped meal. 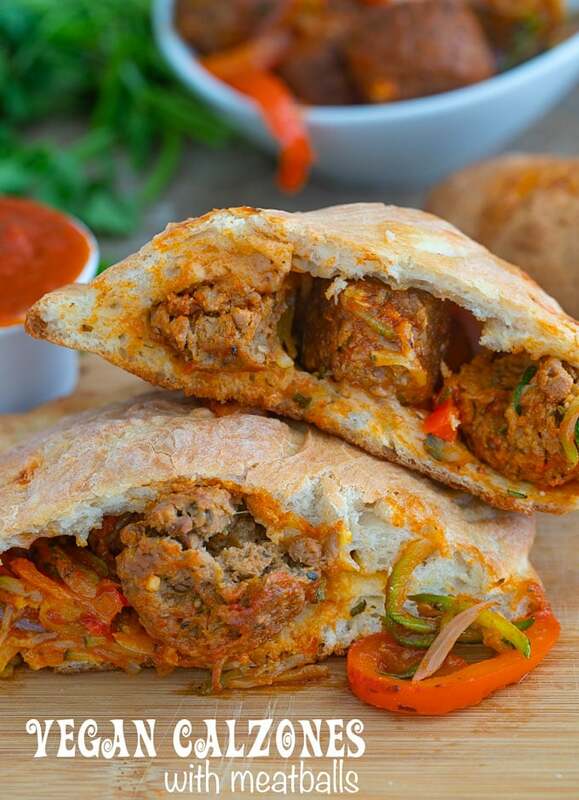 The calzone can be stuffed with almost anything (like meatballs) where as the stromboli has limitations (no meatballs). 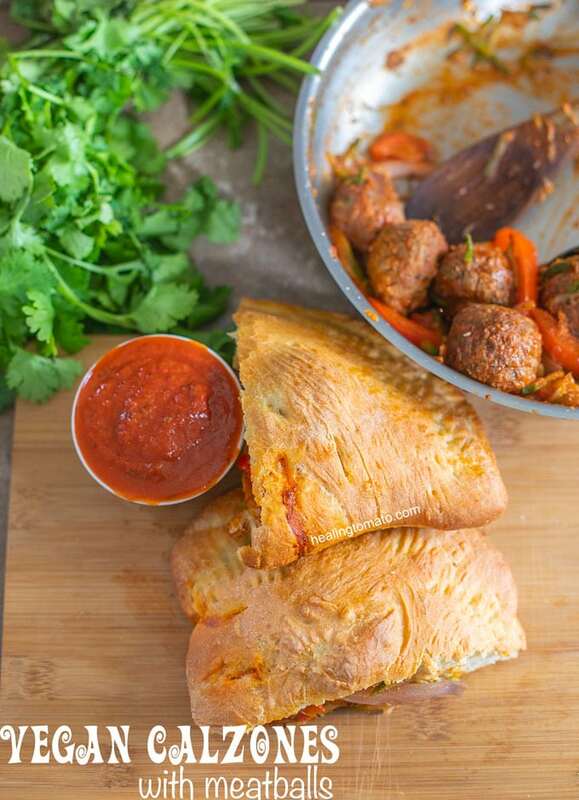 Stromboli is rolled in which is about 2 layers and it kind of makes it hard to stuff some ingredients. It tastes just as delicious as calzones but harder to stuff. I like them both, but, I am biased towards calzones. 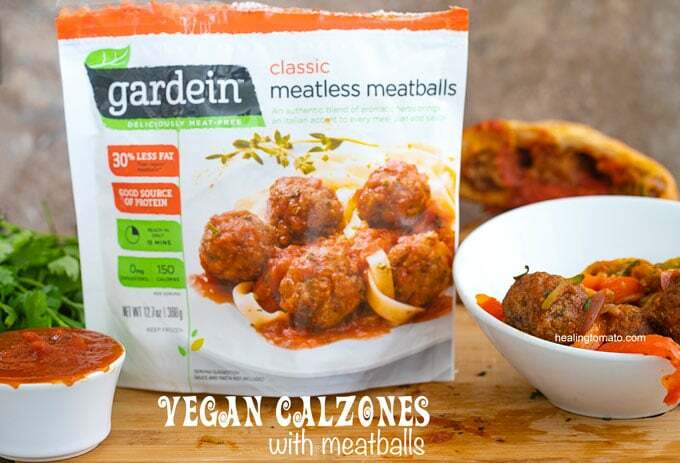 These meatballs by Gardein are all vegan, have non-GMO ingredients and a good source of protein! You know how much I love vegan food that has built in protein, right? Gardein’s Meatless Meatballs are made with all vegan friendly ingredients which always makes me happy. If you are not sure about an ingredient, consult my “What vegans don’t eat” guide or feel free to contact me directly. I am always happy to hear from my readers. My favorite way to cook them is in the oven. In there, they cook evenly and all through. They can be cooked in the microwave, but, I wasn’t fan of the texture after microwaving them. After cooking them in a pan with peppers, zoodles and tomato sauce, they were ready to eat just like that. If you don’t feel like stuffing them in a calzone, just eat them right out of the pan like I did. 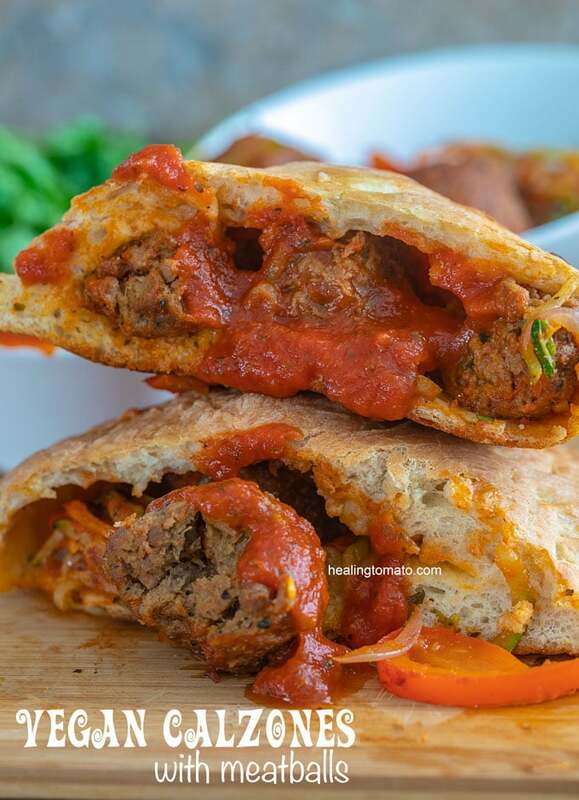 What’s your favorite way to stuff calzones? 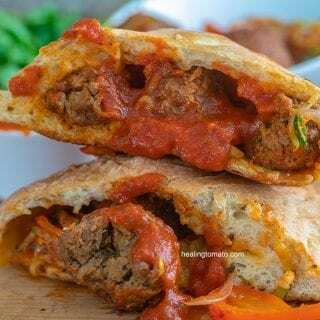 - I put about 3 meatballs per calzone. If you don't want to make all 4 at once, refrigerate the remaining meatballs stuffing and use it in the future.